Hurrah!!!! I've finally bagged my first bastle house. This delightful bastle can be found in a small village called Newbiggin, about 6 miles North of Kirkoswald, and about a mile and a half up the B6413 from Croglin. 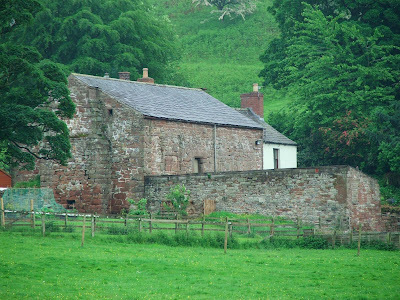 Bastle houses can be found in fairly high numbers throughout Cumbria ...as far south as Newbiggin, Croglin and nearby Glassonby....but possibly with some in the fortified villages even further south, such as Temple Sowerby, Milburn and Askham. In the latter villages, these buildings may just have been robust houses with thick walls with the capability of safely housing livestock...stronghouses in other words. Bastles were often built as part of a group, so that threatened tenant farmers could provide mutual support in the event of a raid or attack. Newbiggin proves this point beyond a doubt, as this group of buildings are no more than around 100 yards apart, with the exception of Townhead Bastle....built by the Grahams, which is at the end of the valley about a quarter of a mile away. Bastles performed two functions...that of barmkyn and of dwelling. The barmkyn was always on the ground floor, and used to corral livestock, and the dwelling, usually one large room, always on the first floor. These buildings were nearly always of two storeys, with thick walls constructed of mortared stone, quite often with no windows at ground level (for obvious reasons) small windows at the first floor level, and lacking battlements of any description. There are a few bastles with gun loops, but these are very rare. They were built from the mid to late 1500's right through to the late mid 1600's, and only a few have survived in as good condition as this one in Newbiggin. This photo shows the Townhead Bastle, probably home to the Grahams during the 1600's. This bastle is larger than many of its neighbours....indeed the Grahams were a particularly active family in the West March during the reiver years. Originally a Scottish family, the Grahams soon preferred to see themselves as a English, although their allegiances switched according to their whims. During the 1550's, the Grahams were thought to have been the most prolific of border reivers, with around 500 men, and over a dozen towers and fortified residences to their name. There are bastles at Glassonby, only a few miles from Newbiggin, and some other great examples of this type of fortification in other nearby locations. More photos will be added as they are visited.